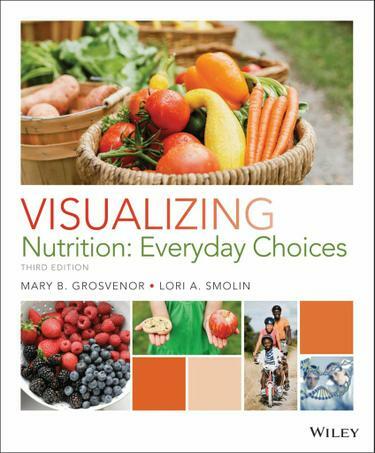 NEW for Spring 2017: Visualizing Nutrition Featuring Food For Thought. This extensive video suite is available through WileyPLUS Learning Space. Videos introduce students to upcoming chapter concepts, underscore the importance of nutritional choices on health, illuminate difficult scientific concepts, and point out helpful practice opportunities and resources in WileyPLUS Learning Space to help them focus their time and study effectively. This digital update also includes an instructor video for each chapter. Visualizing Nutrition, 3e is intended for a one-term course in Introductory Nutrition taught at both two- and four-year schools. Visualizing Nutrition, 3e offers students a valuable opportunity to identify and connect the central issues of nutritional science in a visual approach. As students explore the critical topics of nutrition, they create a desire to understand the topics through demonstration of their relevance to the reader’s personal life. The material provides students with the decision-making skills needed throughout their lifespan to navigate the myriad choices they will face in promoting their good health and in preventing disease. Visualizing Nutrition’s critical thinking approach and a solid underpinning of the process of science empowers students to be knowledgeable consumers when faced with decisions about what to eat. The premier art program, interactive components, and applicable content make this a sure winner in sharing ones passion for Nutrition and engaging students.